Coordonnateur : Parker Kenneth P.
Boundary-Scan, formally known as IEEE/ANSI Standard1149.1-1990, is a collection of design rules applied principally atthe Integrated Circuit (IC) level that allow software to alleviate thegrowing cost of designing, producing and testing digital systems. Afundamental benefit of the standard is its ability to transformextremely difficult printed circuit board testing problems that couldonly be attacked with Ad-Hoc testing methods into well-structuredproblems that software can easily and swiftly solve. IEEE testing standards of the 1149 family are living entities thatgrow and change quickly. The Boundary-Scan Handbook, Third Edition isintended to describe these standards in simple English, rather thanthe strict and pedantic legalese encountered in the standards. Over180 drawings and 40 tables illustrate important concepts. Forty-sixDesign-for-Test rules are provided, with complete explanations. The fundamental 1149.1 standard is now over 13 years old and has alarge infrastructure of support in the electronics industry. Today, amajority of custom ICs and Programmable Logic Devices have 1149.1implementations. The Boundary-Scan Handbook, Third Editionupdates the information about 1149.1, which has been revised asrecently as 2001. 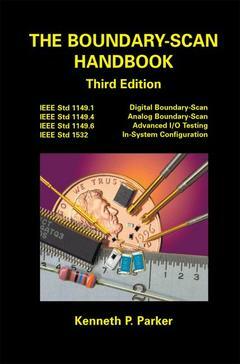 It contains a description of the 1149.4 AnalogBoundary-Scan standard, and gives a tutorial on analog testingtechnology. It then introduces the recently released IEEE 1149.6Advanced I/O standard, which extends Boundary-Scan to deal withAC-coupled differential signaling now becoming common in higherperformance system. Finally, since a board test system provides asuitable environment for programming non-volatile Programmable LogicDevices, the IEEE 1532 standard is described which extends the 1149.1access protocol into the device programming domain. This forms anessential tools for testing boards and systems of the future. 1 Boundary-Scan Basics and Vocabulary.- 1.1 Digital Test Before Boundary-Scan.- 1.1.1 Edge-Connector Functional Testing.- 1.1.2 In-Circuit Testing.- 1.2 The Philosophy of 1149.1.- 1.3 Basic Architecture.- 1.3.1 The TAP Controller.- 1.3.2 The Instruction Register.- 1.3.3 Data Registers.- 1.3.4 The Boundary Register.- 1.3.5 Optimizing a Boundary Register Cell Design.- 1.3.6 Architecture Summary.- 1.3.7 Field-Programmable IC Devices.- 1.3.8 Boundary-Scan Chains.- 1.4 Non-Invasive Operational Modes.- 1.4.1 BYPASS.- 1.4.2 IDCODE.- 1.4.3 USERCODE.- 1.4.4 SAMPLE.- 1.4.5 PRELOAD.- 1.5 Pin-Permission Operational Modes.- 1.5.1 EXTEST.- 1.5.2 INTEST.- 1.5.3 RUNBIST.- 1.5.4 HIGHZ.- 1.5.5 CLAMP.- 1.5.6 Exceptions Due to Clocking.- 1.6 Extensibility.- 1.7 Subordination of IEEE 1149.1.- 1.8 Costs and Benefits.- 1.8.1 Costs.- 1.8.2 Benefits.- 1.8.3 Trends.- 1.9 Other Testability Standards.- 2 Boundary-Scan Description Language (BSDL).- 2.1 The Scope of BSDL.- 2.1.1 Testing.- 2.1.2 Compliance Assurance.- 2.1.3 Synthesis.- 2.2 Structure of BSDL.- 2.3 Entity Descriptions.- 2.3.1 Generic Parameter.- 2.3.2 Logical Port Description.- 2.3.3 Standard USE Statement.- 2.3.4 Use Statements.- 2.3.5 Component Conformance Statement.- 2.3.6 Device Package Pin Mappings.- 2.3.7 Grouped Port Identification.- 2.3.8 TAP Port Identification.- 2.3.9 Compliance Enable Description.- 2.3.10 Instruction Register Description.- 2.3.11 Optional Register Description.- 2.3.12 Register Access Description.- 2.3.13 Boundary-Scan Register Description.- 2.3.14 RUNBIST Execution Description.- 2.3.15 INTEST Execution Description.- 2.3.16 User Extensions to BSDL.- 2.3.17 Design Warnings.- 2.4 Some advanced BSDL Topics.- 2.4.1 Merged Cells.- 2.4.2 Asymmetrical Drivers.- 2.5 BSDL Description of 74BCT8374.- 2.6 Packages and Package Bodies.- 2.6.1 STD_1149_1_2001.- 2.6.2 Cell Description Constants.- 2.6.3 Basic Cell Definitions BCO to BC7.- 2.6.4 Cells BC_8 to BC_10 Introduced in 2001.- 2.6.5 User-Defined Boundary Cells.- 2.6.6 Definition of BSDL Extensions.- 2.7 Writing BSDL.- 2.8 Summary.- 3 Boundary-Scan Testing.- 3.1 Basic Boundary-Scan Testing.- 3.1.1 The 1149.1 Scanning Sequence.- 3.1.2 Basic Test Algorithm.- 3.1.3 The “Personal Tester” Versus ATE.- 3.1.4 In-Circuit Boundary-Scan.- 3.1.5 IC Test.- 3.1.6 ICBIST.- 3.2 Testing with Boundary-Scan Chains.- 3.2.1 1149.1 Chain Integrity.- 3.2.2 Interconnect Test.- 3.2.3 Connection Tests.- 3.2.4 Interaction Tests.- 3.2.5 BIST and Custom Tests.- 3.3 Porting Boundary-Scan Tests.- 3.4 Boundary-Scan Test Coverage.- 3.5 Summary.- 4 Advanced Boundary-Scan Topics.- 4.1 DC Parametric IC Tests.- 4.2 Sample Mode Tests.- 4.3 Concurrent Monitoring.- 4.4 Non-Scan IC Testing.- 4.5 Non-Digital Device Testing.- 4.6 Mixed Digital/Analog Testing.- 4.7 Multi-Chip Module Testing.- 4.8 Firmware Development Support.- 4.9 In-System Configuration.- 4.10 Flash Programming.- 4.11 Hardware Fault Insertion.- 4.12 Power Pin Testing.- 5 Design for Boundary-Scan Test.- 5.1 Integrated Circuit Level DFT.- 5.1.1 TAP Pin Placement.- 5.1.2 Power and Ground Distribution.- 5.1.3 Instruction Capture Pattern.- 5.1.4 Damage Resistant Drivers.- 5.1.5 Output Pins.- 5.1.6 Bidirectional Pins.- 5.1.7 Post-Lobotomy Behavior.- 5.1.8 IDCODEs.- 5.1.9 User-Defined Instructions.- 5.1.10 Creation and Verification of BSDL.- 5.2 Board-Level DFT.- 5.2.1 Chain Configurations.- 5.2.2 TCK/TMS Distribution.- 5.2.3 Mixed Logic Families.- 5.2.4 Board Level Conflicts.- 5.2.5 Control of Critical Nodes.- 5.2.6 Power Distribution.- 5.2.7 Boundary-Scan Masters.- 5.2.8 Post-Lobotomy Board Behavior.- 5.3 System-Level DFT.- 5.3.1 The MultiDrop Problem.- 5.3.2 Coordination with Other Standards.- 5.4 Summary.- 6 Analog Measurement Basics.- 6.1 Analog In-Circuit Testing.- 6.1.1 Analog Failures.- 6.1.2 Measuring an Impedance.- 6.1.3 Errors and Corrections.- 6.1.4 Measurement Hardware.- 6.2 Limited Access Testing.- 6.2.1 Node Voltage Analysis.- 6.2.2 Testing With Node Voltages.- 6.2.3 Limited Access Node Voltage Testing.- 6.2.4 The Mixed-Signal Test Environment.- 6.2.5 Summary.- 7 IEEE 1149.4: Analog Boundary-Scan.- 7.1 1149.4 Vocabulary and Basics.- 7.1.1 The Target Fault Spectrum.- 7.1.2 Extended Interconnect.- 7.1.3 Digital Pins.- 7.1.4 Analog Pins.- 7.2 General Architecture of an 1149.4 IC.- 7.2.1 Silicon “Switches”.- 7.2.2 The Analog Test Access Port (ATAP).- 7.2.3 The Test Bus Interface Circuit (TBIC).- 7.2.4 The Analog Boundary Module (ABM).- 7.2.5 The Digital Boundary Module (DBM).- 7.3 The 1149.4 Instruction Set.- 7.3.1 The EXTEST Instruction.- 7.3.2 The CLAMP Instruction.- 7.3.3 The HIGHZ Instruction.- 7.3.4 The PROBE Instruction.- 7.3.5 The RUNBIST Instruction.- 7.3.6 The INTEST Instruction.- 7.4 Other Provisions of 1149.4.- 7.4.1 Differential ATAP Port.- 7.4.2 Differential I/O.- 7.4.3 Partitioned Internal Test Buses.- 7.4.4 Specifications and Limits.- 7.5 Design for 1149.4 Testability.- 7.5.1 Integrated Circuit Level.- 7.5.2 Board Level.- 7.5.3 System Level.- 7.6 Summary.- 8 IEEE 1149.6: Testing Advanced I/O.- 8.1 The Advanced I/O Problem.- 8.1.1 Traditional Inter-IC Communication.- 8.1.2 Advanced Inter-IC Communication.- 8.1.3 AC Coupled Signal Paths.- 8.1.4 Testing Advanced I/O.- 8.2 1149.6 Vocabulary and Basics.- 8.2.1 Advanced I/O.- 8.2.2 Signal Pin Categories.- 8.2.3 Operational Modes.- 8.3 Test Facilities for Ac Pins.- 8.3.1 Provisions for All Signal Pins.- 8.3.2 Provisions for AC Pin Drivers.- 8.3.3 AC/DC Selection Cells.- 8.3.4 Provisions for AC Pin Receivers.- 8.4 The Defect Model for 1149.6.- 8.5 The 1149.6 Test Receiver.- 8.5.1 Test Receiver Definitions.- 8.5.2 Transitions.- 8.5.3 Test Receiver DC Response.- 8.5.4 Test Receiver AC Response.- 8.5.5 Guaranteed AC-Coupling.- 8.5.6 An Integrated AC/DC Test Receiver.- 8.5.7 Initializing and Capturing Hysteretic Memory.- 8.6 BSDL Extensions for 1149.6.- 8.6.1 Boundary Registers Cells for 1149.6.- 8.6.2 STD_1149_6_2003.- 8.6.3 Example 1149.6 Device and BSDL.- 8.7 Design for 1149.6 Testability.- 8.7.1 Integrated Circuit Level DFT.- 8.7.2 Board-Level DFT.- 8.8 Summary.- 9 IEEE 1532: In-System Configuration.- 9.1 IEEE 1532 Vocabulary and Basics.- 9.1.1 Fixed System Pins.- 9.1.2 ISC System Pins.- 9.1.3 System Modal States.- 9.1.4 System I/O Behavior.- 9.1.5 ISC Pin I/O Cell Design.- 9.2 Programming Features of IEEE 1532.- 9.2.1 Core 1532 Programming Instructions.- 9.2.2 Programming a Single, Simple 1532 Device.- 9.2.3 Concurrent Programming of Multiple Devices.- 9.3 Design for IEEE 1532 Programmability.- 9.4 Epilog: What Next for 1149.1,1149.4,1149.6 and 1532?.- A. BSDL Syntax Specifications.- A.l Conventions.- A.2 Lexical elements of BSDL.- A.3 Notes on syntax definition.- A.4 BSDL Syntax.- A.5 User Package Syntax.- A.6 1149.6 Extention Attribute Syntax.